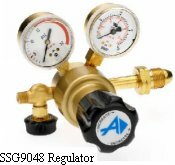 This regulator is specifically designed for use with Atomic Absorption or Technical Grades of Acetylene. Although similar to our Model SSE regulator, its delivery pressure gauge features a red line warning above 15 psig to indicate unsafe delivery pressure for acetylene. Limited Delivery Pressure Adjustment does not allow delivery pressure above 15 psig as recommended for Acetylene service. Neoprene Diaphragm permits accurate delivery pressure settings. Red-Lined" Delivery Pressure Gauge provides visual indication should delivery pressure exceed allowable withdrawal pressure of 15 psig. Outlet Metering Valve provides flow control. Acetylene Flash Arrestor prevents flashback into cylinder. * If selected, these items are not installed on the regulator. They are shipped as separate items.